Spring is finally here and summer is just around the corner – hallelujah! 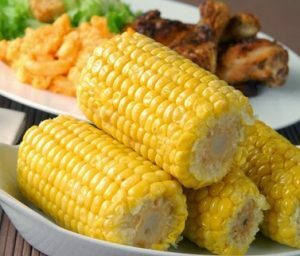 With that comes the mid-western food delight of sweet corn. My family loves corn on the cob and my toddler daughter can eat two ears herself, but as a surgeon I have trepidation every time I fix it for the foreign body risk it is for my golden retriever. Let alone the risk of direct ingestion, as my daughter accidentally drops it from having buttery fingers, to him possibly finding the cobs in the trash; either one is an intestinal obstruction waiting to happen. When dogs swallow corn on the cob they typically chew it to an extent, but usually swallow chunks of the cob that are not digestible, because they are in a hurry to eat it and not get caught! These cob chunks can hang out in the stomach for some time before moving into the small intestines where they usually get stuck! Clinical signs of intestinal obstruction include: vomiting, inappetence or anorexia, and in some cases diarrhea. 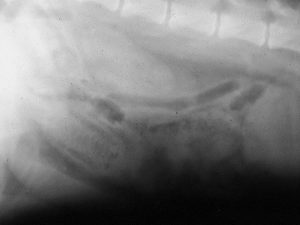 A corn cob intestinal obstruction is diagnosed most commonly on abdominal radiographs/x-rays because the cob can be seen. In the radiograph below, the cob is in the lower left section. Some dogs can pass the cob completely without having a surgical obstruction, but I wouldn’t take those odds! Intestinal surgery to remove the corn cob can be a simple enterotomy, which is an incision made into the bowel, then the cob is removed and bowel wall sutured closed. Sometimes it is necessary to remove an entire portion of the bowel due to pressure necrosis from being stuck in the same place for too long. Either surgery comes with the potential complication of breakdown of the suture line in the bowel, typically 3-5 days after surgery. If this occurs, then the intestinal contents leak into the abdomen and cause a severe abdominal infection called a septic abdomen. 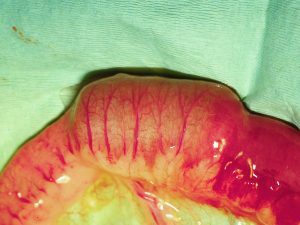 The picture above shows an intraoperative view of the small intestines with a corn cob obstruction prior to surgical removal. This cob was removed by one incision and did not require resection of a portion of the small intestines. 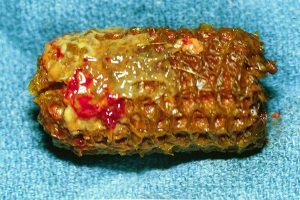 The bruised intestine to the right of the cob shows the damage it inflicts as it moves through the bowel. Below is the indigestible cob after it was removed from the small intestine. My warning to you this summer during your backyard barbecues is to make sure people don’t leave their plates lying around with kernel empty cobs. 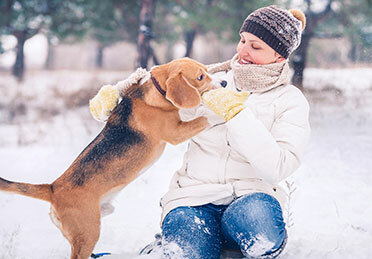 Quickly dispose of them in a dog-proof trash can so you and your furry friend can enjoy a summer that does not include this preventable mishap.